I've been a Bitcoin follower now for just over 12 months. In that time i've built up some coin from mining, gambling and other methods. In this article I'll explain some of the methods i'm now using to help increase my coins since mining has become pointless on anything less than an ASIC. If you're unsure what bitcoin is then please read my starter article. This article will be updated regularly so that you can see how each is doing and new sites will be added as and when they are tested and return results. Bit-Mining is another cloud hashing service, this one has been developed solely for Litecoin mining. While the site isn't as pretty as other crypto offerings it is functional and has a growing number of users. They have had some initial problems (as most crypto sites do) but the support staff and members are quick to try and help anyone with issues. As I've only been using the site for a short time I don't feel ready to 100% recommend yet. 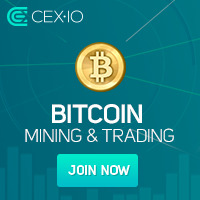 CEX.IO is a platform where you can trade GHs and Bitfury Chips real-time with other authorized CEX.IO users. Your buy or sell orders are matched against a parameterized database of other orders. If a perfect match is found, a caps trade is executed instantly. If there are no matching orders at the price you specified, then your order remains opened. While it's difficult to say exactly how much has been made or lost using CEX, i find the platform easy to use and great fun. As owning a mining machine becomes less profitable, cloud hashing is something I see as a viable and affordable alternative. For very little initial outlay you can have a bitcoin miner that you don't have to host or configure, which pays out to your wallet automatically (when your balance reaches 0.01). The other part of the website is the trading platform which allows you to buy and sell GHs. With the market in constant flux you have the constant thrill of potentially increasing your worth in a matter of minutes. With the very recent addition of some alt coins you now have even more chances to increase your crypto stocks. The system looked good and was working intially, then they took everyones bitcoins and pulled the service citing PayPal transactions as the problem.